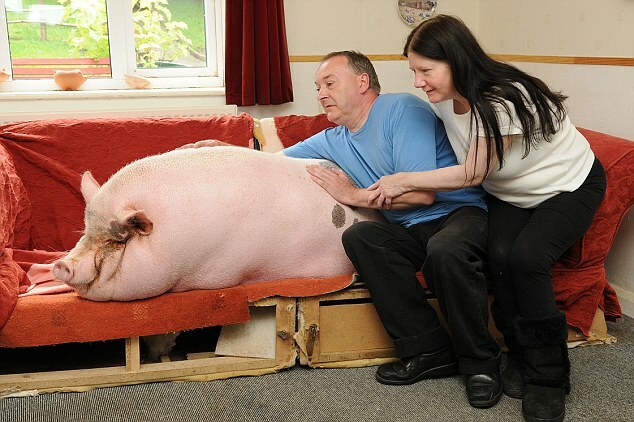 A couple who bought a trendy micro pig as a pet have been left stunned after the supposedly pint-sized porker grew to a whopping 25 stone and took over their terraced home. Just 19 months ago 'Babe' was irresistibly cute and so small all four of her tiny trotters would fit in a tea cup. Colin Webb took one look at the nine ounce pink bundle he’d found for sale on the internet and cheerfully handed over £250 to buy her as a gift for his wife Susie. But while the miniature pigs owned by the likes of Paris Hilton and Victoria Beckham grew to around four and a half stone and 14 inches tall - then stopped - the Webbs’ pet had other ideas. Babe's already a three foot, 25 stone monster and is getting bigger every week on a diet of pig pellets, bananas, strawberries and a daily dose of cod liver oil to keep her joints supple. 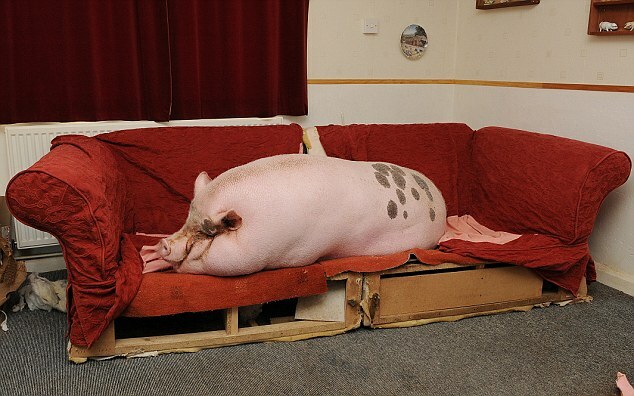 She is now so large she cannot even fit into the kitchen in the Webbs’ three-bedroom terraced home. She used to snooze at the bottom of their bed each night, but can no longer make it up the stairs. So now she sleeps in the living room on their sofa - which Colin has had to have specially re-enforced with chipboard to take her weight. And any hope the Webbs once had of getting Babe to trim down a touch with a bit of exercise have long gone. 'She just won’t leave the house any longer,' said Colin. 'I used to take her for walks on a lead, I got a special licence from Defra to do that, but she’s not having that anymore. She flatly refuses to put a trotter past the front step. 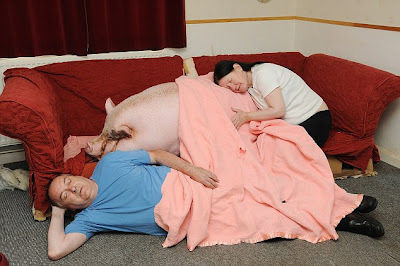 But bizarrely, the Webbs are delighted to share their small home with their ever larger pet pig. 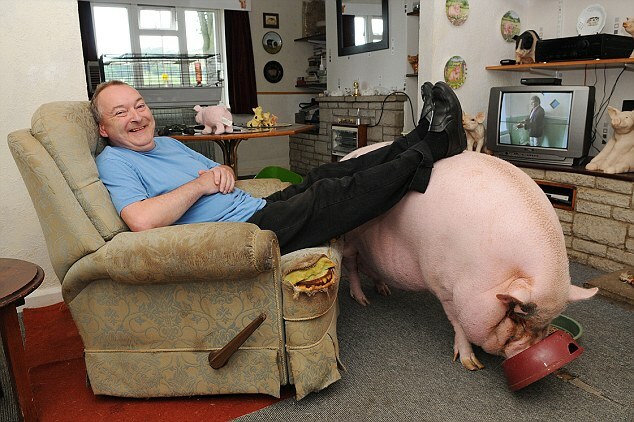 'She’s easier to look after than any man,' said Susie, 53, from Scarborough, North Yorkshire. Former maintenance engineer Colin, 57, added: 'When she started growing I got in touch with the farmer down in Lincolnshire I bought her off. 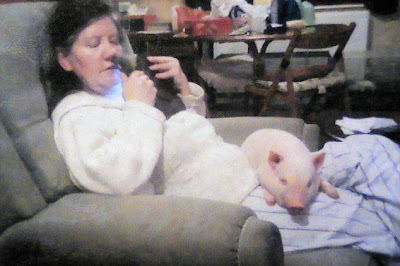 I thought maybe there had been a mistake and ‘Babe’ wasn’t a micro pig. 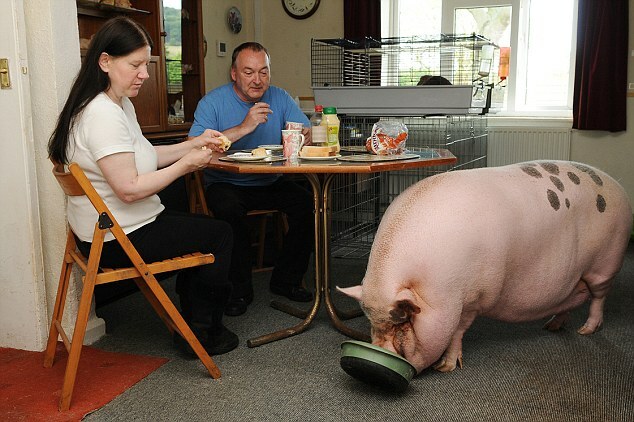 'But I’ve contacted other people who got pigs from the same litter and they all stayed small. 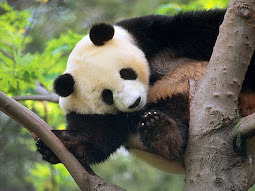 'I don’t know what’s happened with ours, maybe we overfed her a bit, but she’s one heck of a size now.